For almost two years, Bethan Germon held vigil at her baby’s bedside as doctors told her little Lydia had just months to live. 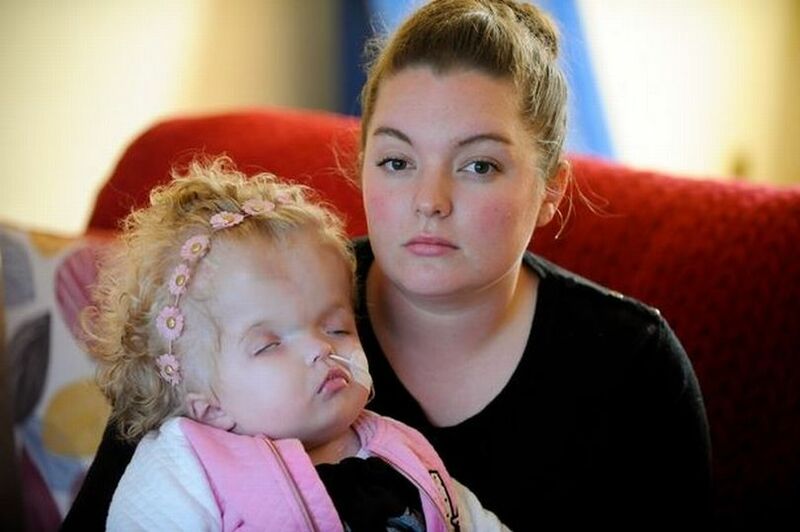 Lydia was born with a rare condition called Dandy Walker syndrome, which causes a build-up of fluid to her brain, meaning her head can swell to nearly twice its usual size. Now two, Lydia is miraculously still alive, but Bethan did not realise quite how hard life would be for her daughter outside hospital. Hurtful and abusive comments both in the street and online are part of “everyday life”, she says. “We spent 21 months of Lydia’s life in hospital and as soon as she got out last year we were like: ‘Yay! This is amazing. We can take her out and about,” adds Bethan, 30. She recalled one incident at a supermarket when two children started laughing at Lydia and stuck two fingers up at her. Then, to Bethan’s horror, the boys’ mother starting joining in. “I maybe expect that kind of behaviour from children, who don’t always know any better, but not from adults,” says Bethan, who has another daughter, Caitlin, nine. Bethan, of Swansea, has also been inundated with vile messages from trolls online. They revealed disability hate crimes tripled in the space of just a year from 2015-2016 in London alone – including nearly 2,000 violent attacks on disabled people. And it is not just disabled people being targeted. Metropolitan Police statistics show hate crimes in London increased by 21% in three years to 125,898. Student Will Mayrick, 20, was choked by two youths and forced to apologise for being gay in a homophobic attack on the Tube in October.